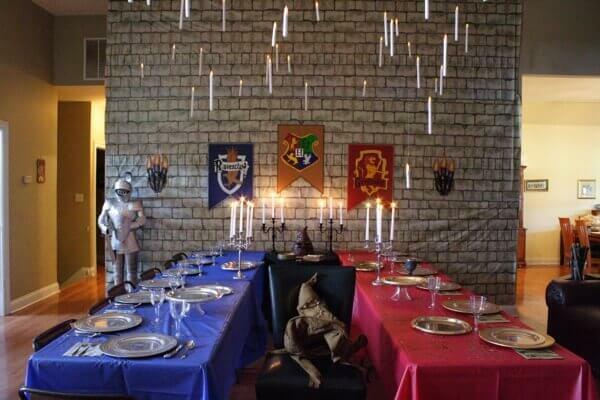 If you’re as obsessed with Harry Potter as we are, you may want to throw your own Harry Potter Party. There are so many great ideas out there and we’ve rounded up some of our favorites. 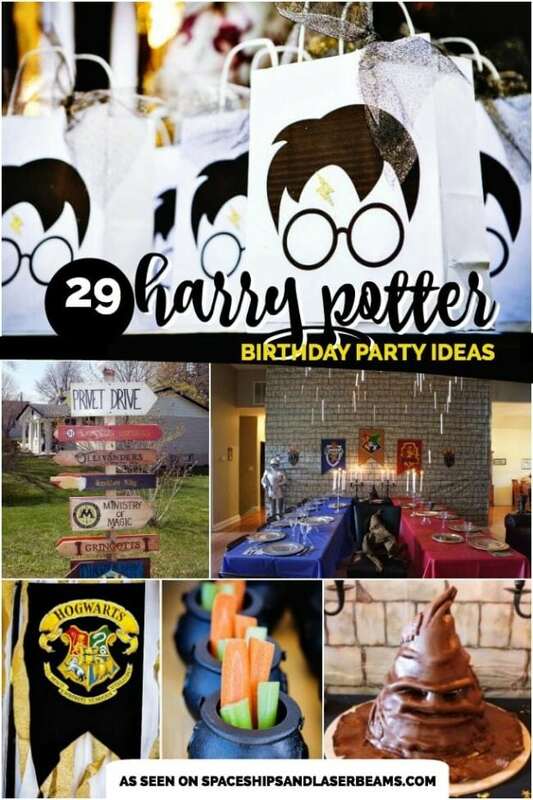 Which of these 29 creative Harry Potter party ideas do you like most? We’re excited about the transfiguration photo booth, and definitely want to try our hand at making the Hedwig owl cupcakes. Don’t miss the Harry Potter unicorn blood favor idea or the potion jar centerpieces. There is so much magic to create. Don’t miss these great 23 Magical Knights and Dragons Party Ideas. 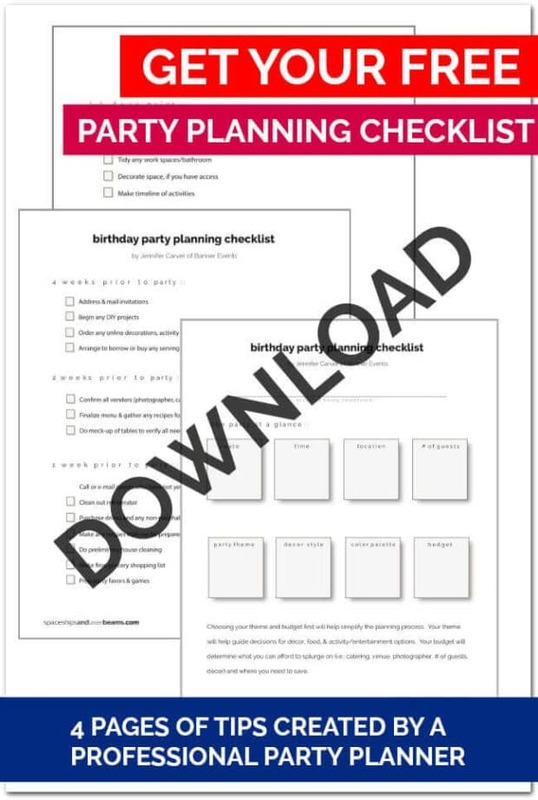 Get some more party ideas with this magic themed birthday celebration. 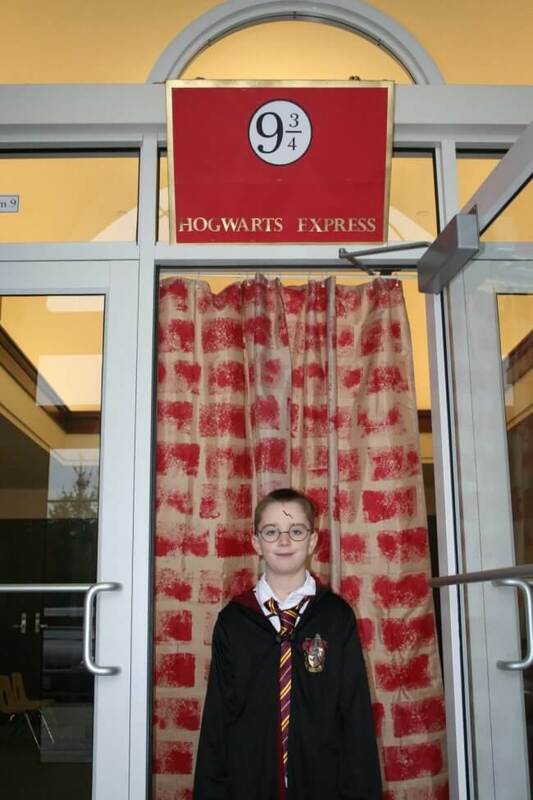 Hang a black sheet or curtain to create a backdrop for your own Harry Potter party transfiguration photo booth. Incorporate movie-inspired props like wizard robes and hats, magic wands, toy owls, and brooms for guests to use for a photo op. Now you can have the creamy, sweet, butterscotch goodness of Butterbeer in fudge form. This recipe only uses 3 ingredients — white chocolate chips, a jar of marshmallow cream, and a jar of butterscotch topping. Surprise guests at your Harry Potter party with a trip to Honeydukes Sweet Shop. Stock it with wizard favorites like chocolate frogs, Bertie Bott’s Every Flavor Beans, licorice wands, and other treats inspired by the book/movie. Make your own Platform 9 ¾ for party guests to run through. This one is created by sponging brick red paint on to a shower curtain hung from spring loaded rods. Everyone knows that at Hogwarts, students are sorted into one of 4 houses. 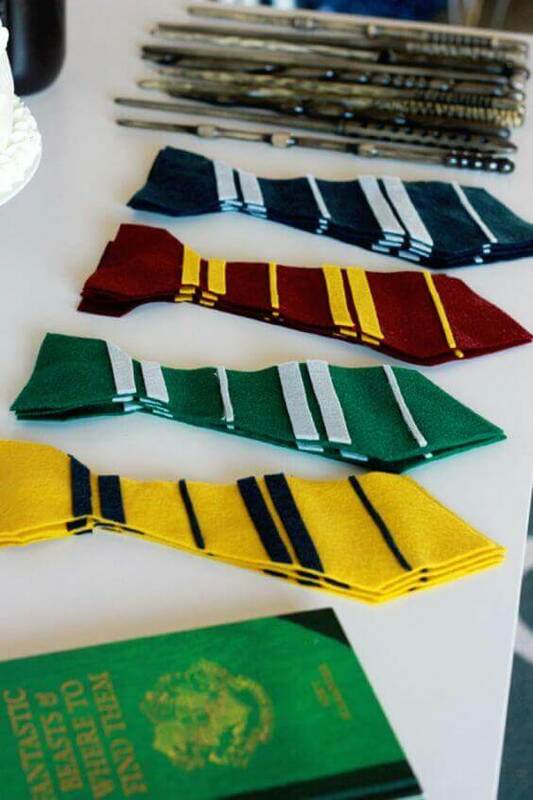 Now your party guests can show off their new house assignment by wearing a Harry Potter felt tie. They make a great favor that you can DIY using this tutorial, some felt, hot glue, and a metal hair clip. Transforming your party space into something that looks like Hogwarts Castle, is totally doable with this amazing Harry Potter fake stone wall tutorial. Supplies needed include old white bed sheets, Rit Dye, salt, spray paint and a vinyl stone template (or substitute). Harry Potter fans will go crazy for this non-alcoholic Polyjuice Potion Punch that looks and tastes amazing. It’s really simple to make with only two ingredients—Sprite and lime sherbert—plus green food coloring. A stone wall backdrop boasting Hogwarts house flags sets the scene for an incredible Harry Potter Great Hall dining area. The best detail has to be the LED floating candles in varying heights, hung from fishing line and push pins! 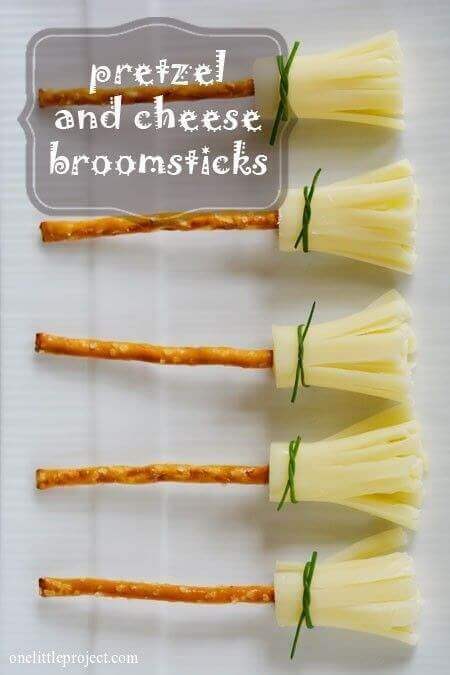 Add these pretzel and cheese broomsticks to your Harry Potter fare. You will need chives, pretzel sticks and string cheese. Every Harry Potter fan knows the Gryffindor colors of burgundy red and gold. 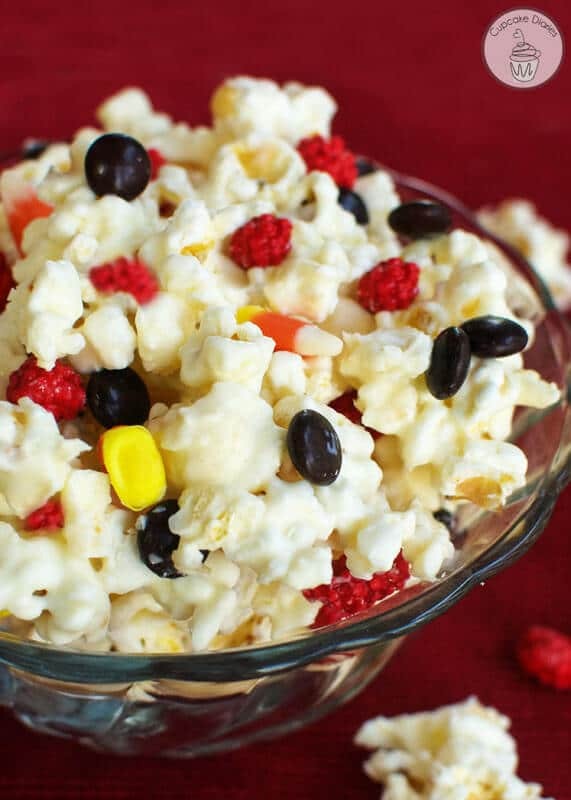 This Gryffindor popcorn recipe gives a nod to Gryffindor with pops of gold and red from candy corn and burnt peanuts, all drizzled with white chocolate and brown M&Ms mixed in. If you want to DIY your own impressive Harry Potter-inspired photo booth, this one is pretty amazing. 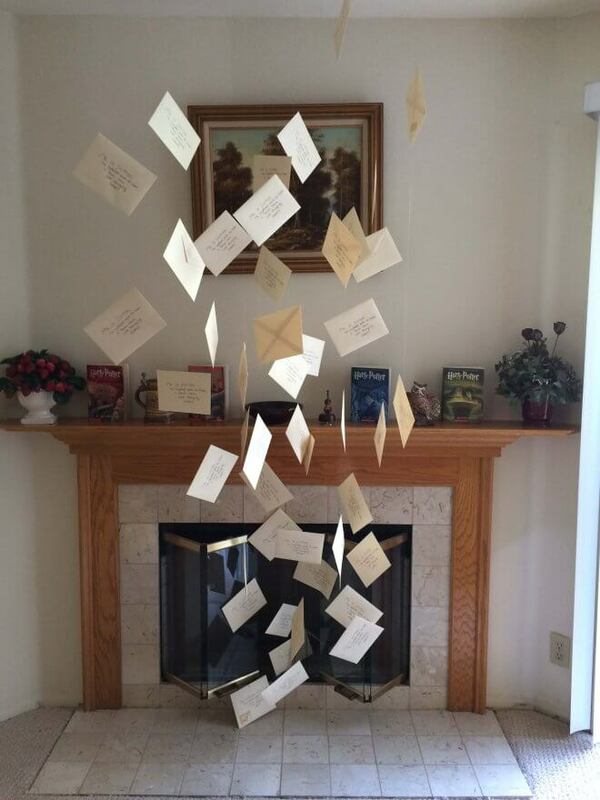 Made to look like the scene from the movie where Harry gets flooded with Hogwarts acceptance letters, it features dozens of letters hanging from fishing line. Plus, a table full of cool handmade photo booth props were available too. What Harry Potter party guest wouldn’t be thrilled to win the Hogwarts House Cup? You can craft one yourself as a prize for a game using an inexpensive gold trophy, adhered to a wood base. 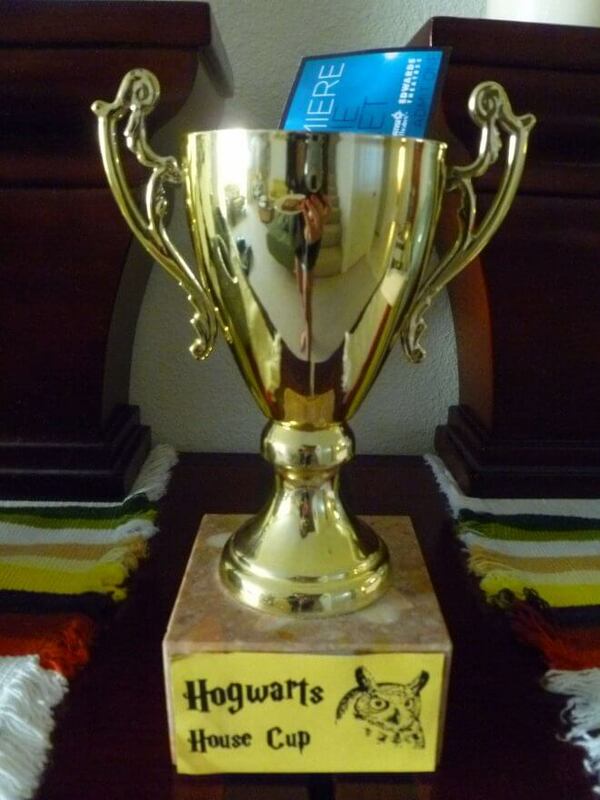 Notice the printable “Hogwarts House Cup” label added to the front and the movie pass prizes peeking out of the cup? 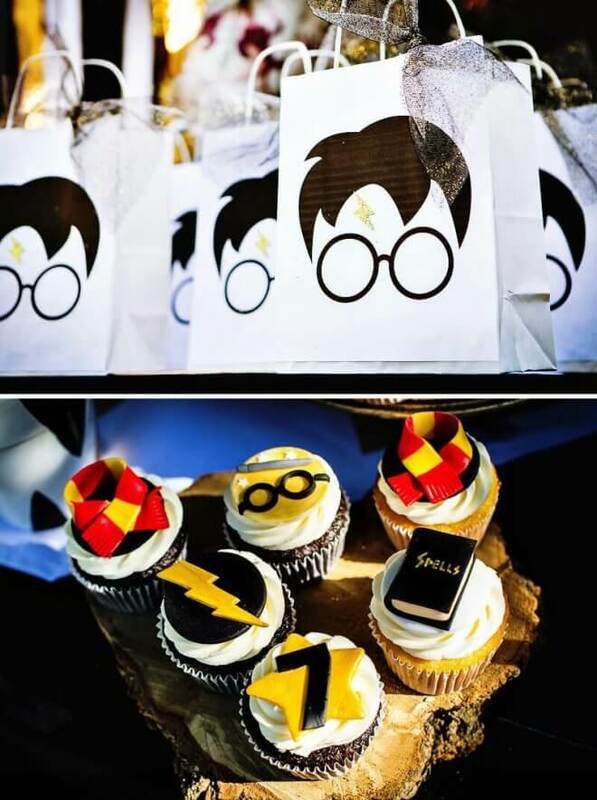 Harry Potter-inspired treats are what set this party apart. 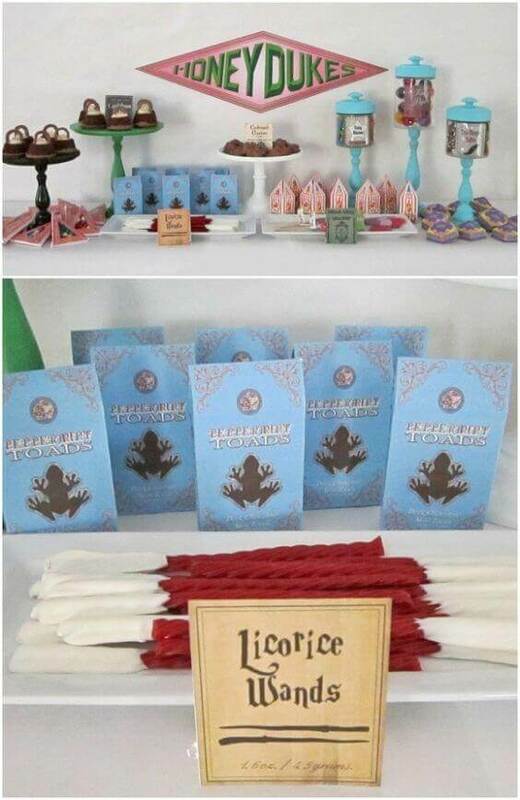 Snitch cake pops, a Sorting Hat cake, chocolate frogs and Dobby candy favors really help drive the party’s theme home. Well-chosen props such as a caged owl, labeled potion jars, an authentic looking Sorting Hat and Quidditch broom helped set the scene for a super cool party! 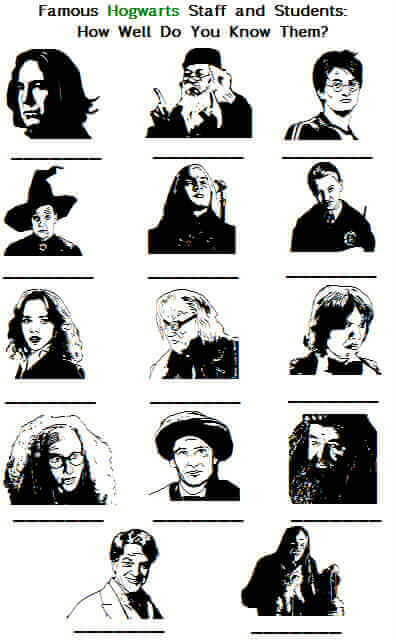 If you’re looking for an easy game for your Harry Potter party guests to play upon arriving, this Hogwarts staff and students matching game is easy to prepare. Using a free Harry Potter font online (which substitutes these Harry Potter photos for letters), you can prep the game and print for easy game play. 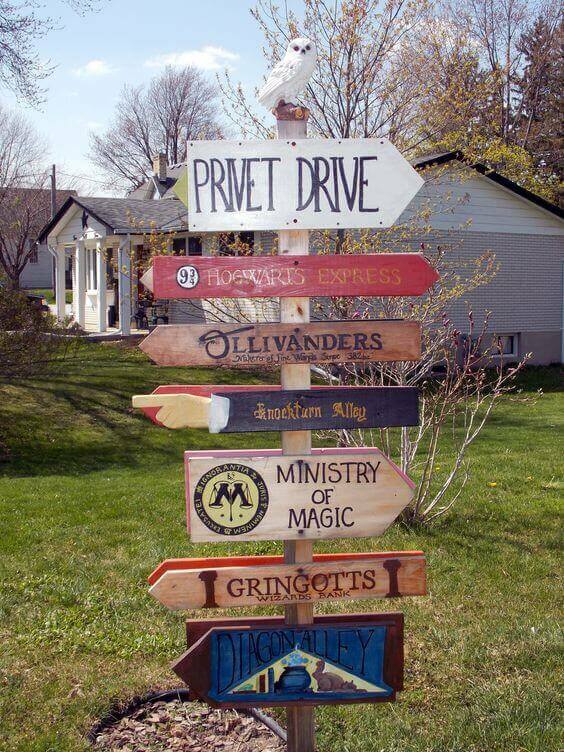 If your party goals include getting guests excited the moment they arrive at the party venue, this Harry Potter sign will definitely help you achieve that goal. Guests will have no problems finding their way around town with signs pointing in the direction of everything they could possibly need (Platform 9 ¾/Hogwarts Express, Gringotts, Diagon Alley, Privet Drive, Ollivanders, Ministry of Magic, to name a few). 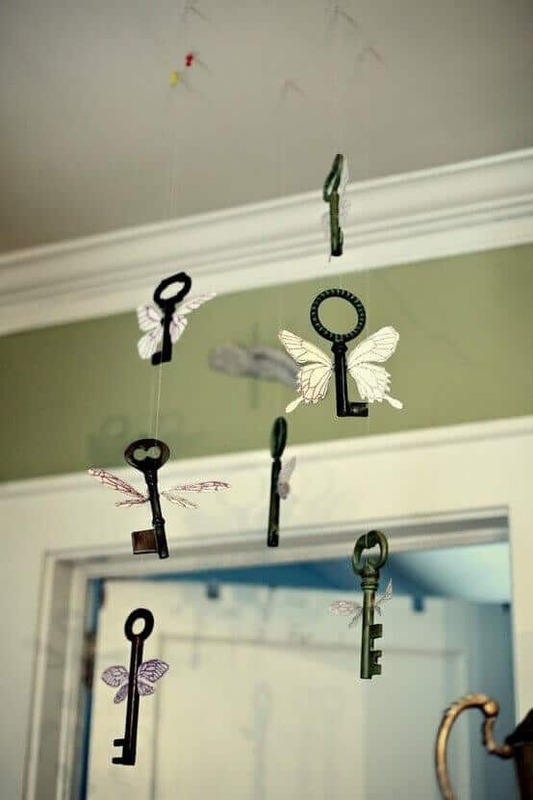 Add wings to antique keys to recreate this Harry Potter floating key scene. This mobile is hung using fishing line! Black and white pair with hints of purple in this Harry Potter “Deathly Hallows”-inspired party. You can recreate the look by adding owls, broomsticks and some Gringotts gold. 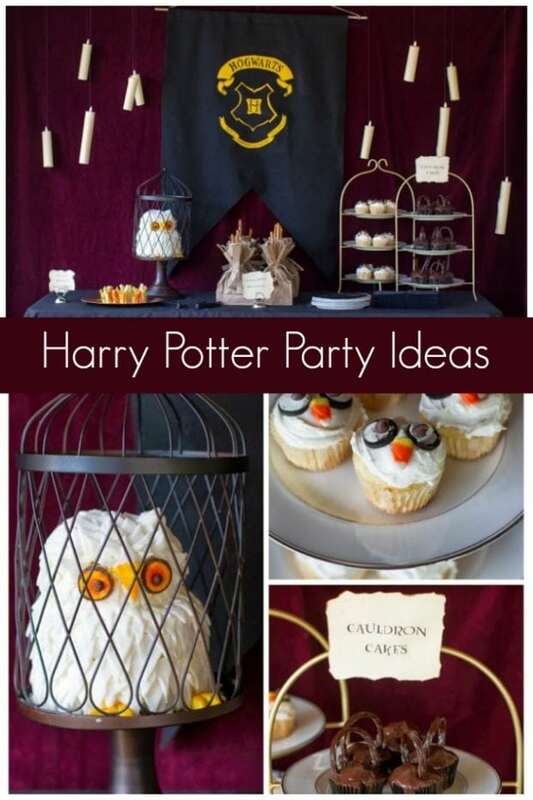 Serve up cauldron cakes, Butterbeer, Polyjuice Potion and Hedwig cookies! Don’t forget the owl treat bags. 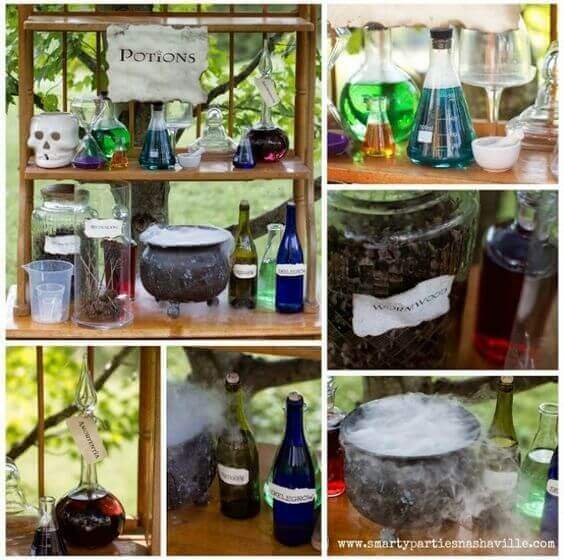 Adding a Potions class to your Harry Potter party, complete with potions decorations, will definitely add some excitement. Filling flasks and beakers with colored “potions”, adding authentic-looking signs and labels and even a bit of dry ice will produce a magical environment. 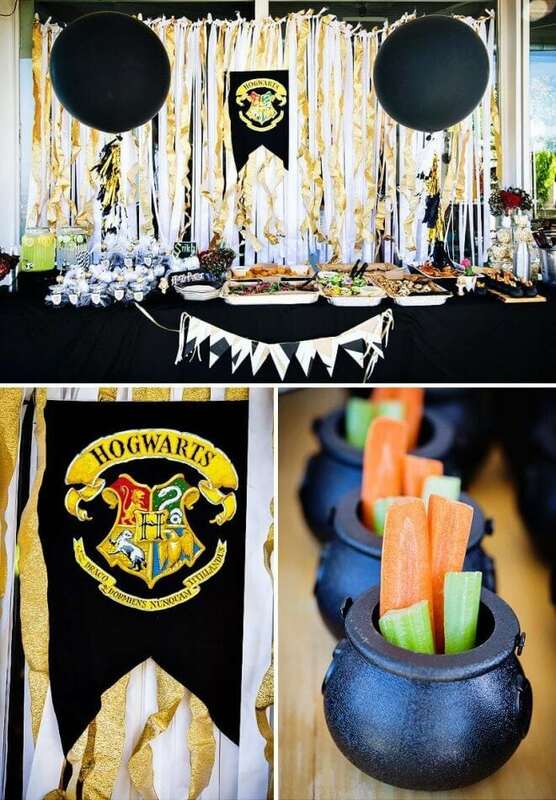 Add a twist to your Harry Potter party sorting ceremony. Instead of a hat doing the sorting, whip up a batch of sorting cupcakes. Any flavor of cupcakes will do, but your frosting will need to be divided into 4 house colors-red for Gryffindor, yellow for Hufflepuff, blue for Ravenclaw and green for Slytherin. You’ll simply insert your frosting tip into the center of your cupcake and squeeze a small dollop into the middle prior to frosting all of the tops of the cupcakes with a plain buttercream. 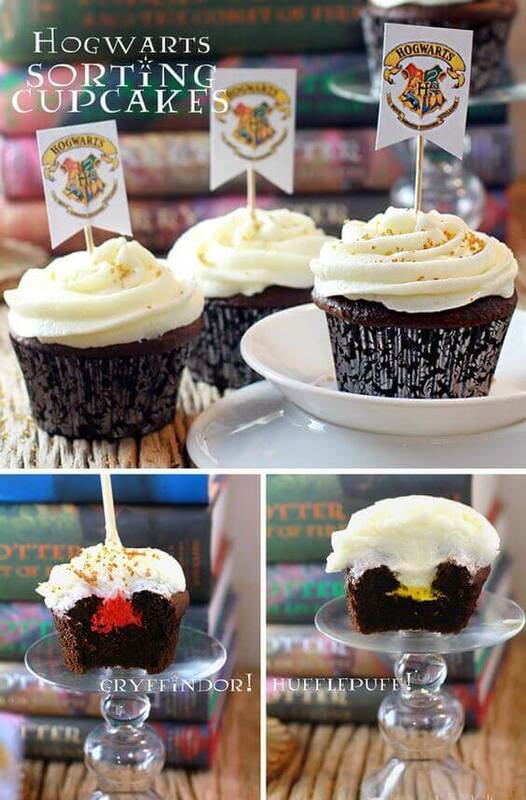 A bite out of their cupcakes will reveal the sorting of each guest into corresponding houses. 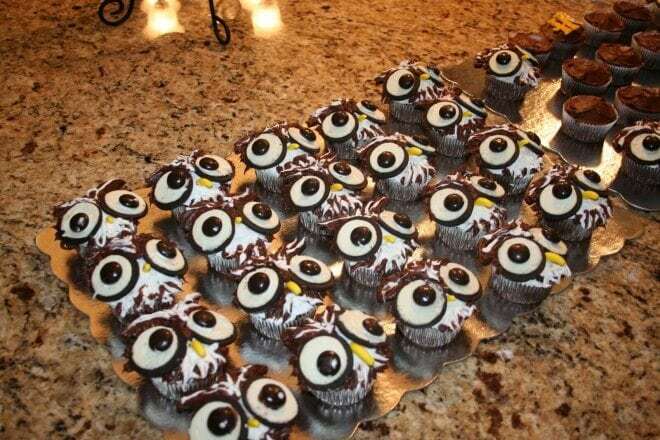 Guests will love seeing their favorite Harry Potter owl — Hedwig — in cupcake form. You’ll need a batch of chocolate cupcakes, a container each of white and chocolate frosting, Oreos, Junior Mints and banana runts to create these feathered friends. 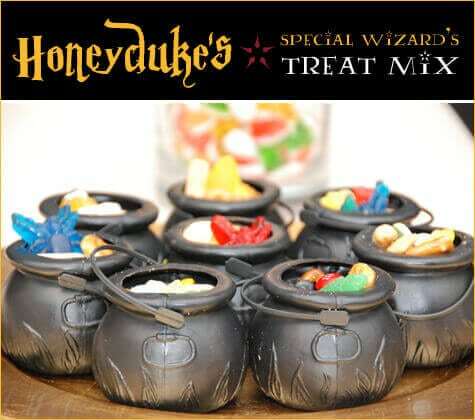 Be on the lookout for mini cauldrons to serve up this Honeydukes special wizard’s treat mix. The treat mix is easy to put together and features Honey Nut Chex Mix, gummy candies like frogs, spiders and worms and burgundy and gold M&Ms. You can download the free printable treat sign. 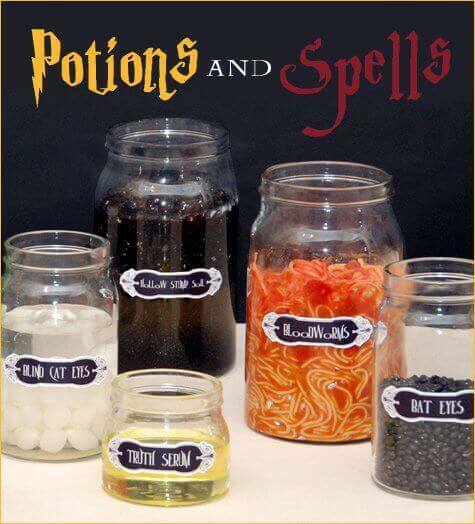 Bring potions class front and center in your Harry Potter party decorations by creating these potion jar centerpieces. Using jars from Ikea and free downloadable printable labels, you can add some ordinary items to create some creepy potion jars. Spaghetti and marinara = Bloodworms. Canned oysters = Hippogriff Gizzards. Backyard weeds in green tinted water = Gillyweed! Send your guests home with a modern take on Harry Potter favor bags. Just add a simple die cut silhouette of Harry’s hair and spectacles, and don’t forget the lightning bolt birthmark. 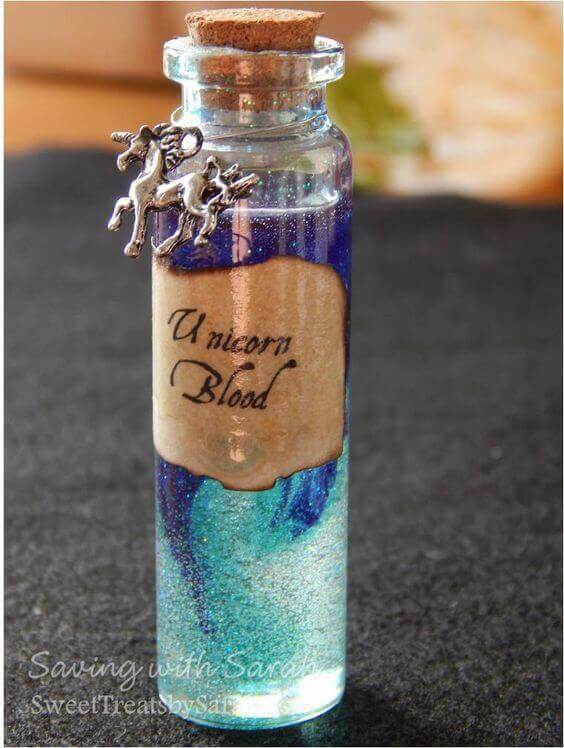 Send Harry Potter party guests home with their own bottles of Unicorn Blood. A small corked bottle and basic craft store ingredients are all you need to make these exciting party favors. Harry Potter party guests will definitely want to know which Hogwarts House they belong to. 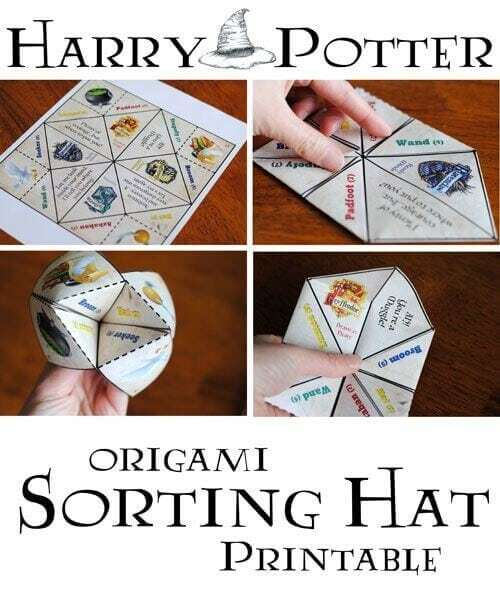 An alternative to using the actual Sorting Hat is to print out one of these free Harry Potter origami sorting hats, sure to enchant the little muggles and wizards at your party. Couldn’t we all use a little magic in our lives? Party guests will go crazy over these Harry Potter printable spell books. 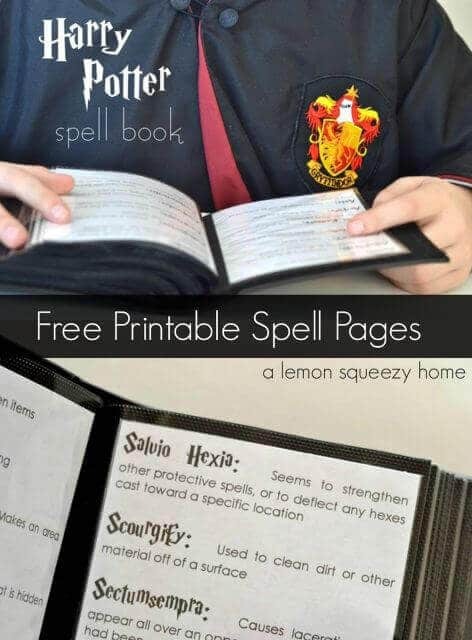 You can make them inexpensively with free printable spell pages and $3 4×6 photo albums. Bubbling cauldrons, Hedwig Mylar balloons, Harry Potter silhouette favor bags, an amazing Snitch cake and magical fondant topped cupcakes are just a very few details from this Harry Potter party that are sure to impress you. Real owls were even featured at the party by someone trained in falconry. 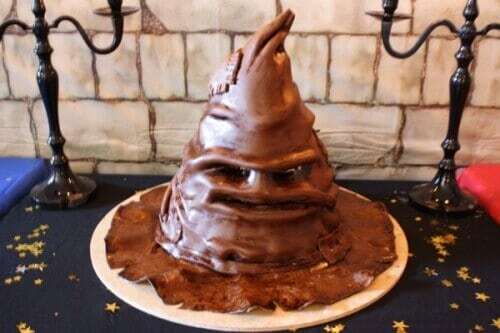 Everyone knows the magic of the Sorting Hat in the Harry Potter books, but the magic of this Sorting Hat cake is something else. It’s covered in chocolate fondant and is so realistic I half expect it to speak. The wand chooses the wizard, or so the story goes. 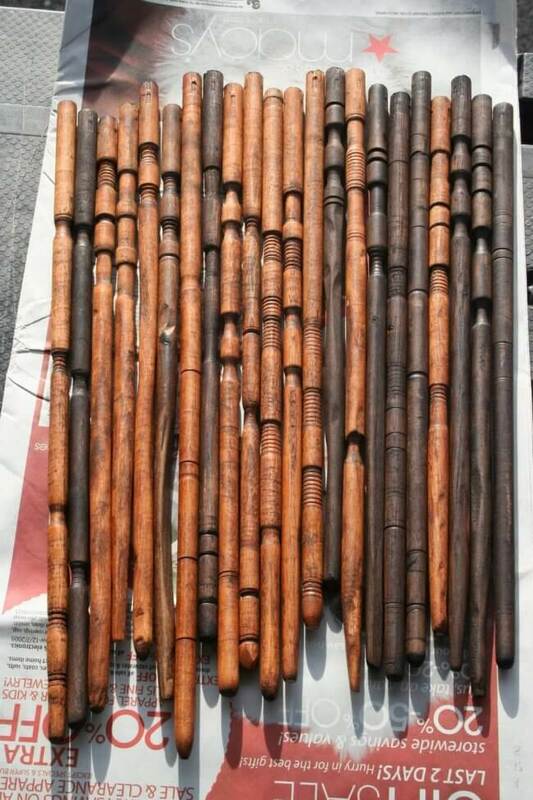 DIY your own wooden dowel wizard wands by making a lathe out of your drill and carving each wand by hand to make them unique. Add a variety of stains and seal them with a clear lacquer.